Educating students is a shared enterprise at Western Oregon University. Not only are students learning in the classroom and in co-curricular activities, but they are learning real-world skills in the workplace. As supervisors, you are helping students to develop knowledge and skills that will help them reach their academic and career goals. 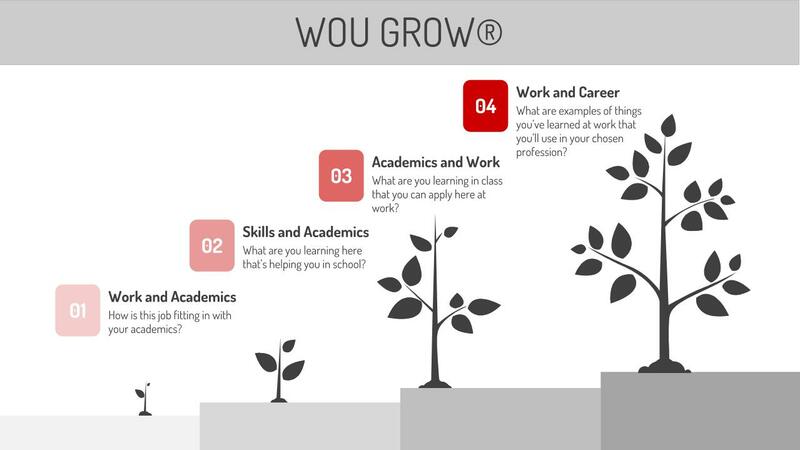 By having WOU GROW® conversations that ask students to make connections between their work and academics, you can ensure that your employees are able to articulate the skills they are gaining, whether on their resume or in a job interview in the future. For supervisors, WOU GROW® can help students become more invested in their work on campus, resulting in more committed and harder working students. These conversations also open the line of communication between you and your student employees. Part of our mission is to foster student success by creating and promoting inclusive educationally purposeful services and activities within and beyond the classroom. It is our goal to make student employment a high-impact activity that allows students reflect and integrate learning through WOU GROW®. See the example conversations below as a guide for having the WOU GROW® conversation. Having two WOU GROW® conversations each semester creates a scaffolding effect in which students build on what they have learned. The more students practice reflecting on the connections between work and academics, the better able they are to articulate how they have grown and what they have learned. We don’t often explain to students why we are doing things. By making the purpose of WOU GROW® clear to students, they will understand why making connections between work and academics is beneficial. This can help them be more engaged in the process. Make WOU GROW® a continuous conversation with student employees. Weave the questions into regular conversations naturally. During subsequent conversations, have students explain what they have learned or what skills they have deepened since your last conversation. How should I prepare for the conversation? Before asking students to reflect on what they have learned on the job, figure out what you expect them to be learning. Consider what skills or knowledge your student employees should gain as a result of working in their position. This can help guide your conversation or allow you to prompt students if you need to. Send students an email or memo to let them know that you will be having an WOU GROW® conversation with them and give them the list of questions beforehand. This will give students a chance to reflect on their learning prior to your conversation. Also, take time to consider the best format for having the conversation with students, whether it is one-on-one, small group, or woven into a conversation during the work day. Consider incorporating the conversation into a one-on-one or meeting that was already planned. How is this job fitting in with your academics? What are you learning here that’s helping you in school? What are you learning in class that you can apply here at work? Can you give me a couple of examples of things you’ve learned here that you think you’ll use in your chosen profession? Ask the questions in your own way and weave them into your conversation naturally. We have created a list of additional questions that can be used to supplement the original questions. It can also be helpful to take notes during your conversations so that you can revisit those topics during later conversations. What if I have a large staff? When you have a large staff, it can be difficult to find time to meet with each student one-on-one twice a semester. It may be helpful to have WOU GROW® conversations in small groups. Keep the group size at eight or fewer to ensure that each student has a chance to speak. Consider having students share their reflections with a partner, and then have the partners report back to the large group about what they talked about. Providing the questions beforehand can also help students to be ready to dive into conversations when they arrive. What if I meet with the same student multiple times? Use notes from previous meetings or your own identified outcomes to prompt students about new skills they may have developed or built upon. Specifically ask students what they have learned since the last meeting. Consider using additional questions along with the main four questions. View the additional questions document for suggested questions. Tell students that you will be having another WOU GROW® conversation in the future, so they can be on the lookout for additional ways that they are learning. What if my student discloses a problem to me? When a student tells you about a concern, this means they trust you and know that you care about them. While it is helpful to listen and show your concern, it is not your job to solve their problem. You can best support your student employee by referring them to a campus or community resource that can better handle their needs. We know that supervisors are doing great work with students, and we want to support you in your efforts. Please contact the Office of the Vice President of Student Affairs (studentaffairs@wou.edu) if you have any questions or concerns about WOU GROW®.